WE DON’T REALLY have much of a baseball scene in Ireland, but it doesn’t look like we’re missing much. Well, that’s if this video of a group of girls at a game between the Colorado Rockies and the Arizona Diamondbacks is anything to go by. 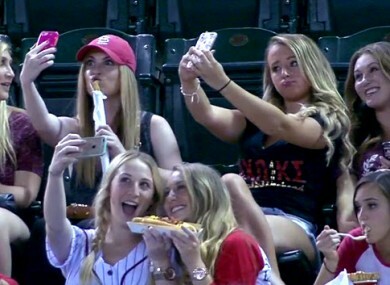 This group of college girls were pretty bored by the whole thing, and decided to spend the game taking selfies and eating churros instead of actually watching it. The commentators stopped what they were doing and began narrating the girls’ quest to get the perfect selfie. Here’s my first bite of the churro. Here’s my second bite of the churro. Email “These girls are going viral for completely ignoring a game to take selfies”. Feedback on “These girls are going viral for completely ignoring a game to take selfies”.